By now you all know that Jay-Z took Beyonce to Cuba. And that by doing so they have gone against the law and the american government which with its embargo against Cuba strongly invites its citizens not to go there for vacations and forgives its citizens to spend money their. That everyone has said ” not cool” that Jay-Z released a song saying , ” But Obama told me I could go” and that the White House has denied any action from the president in that regard. So goes the gossip. 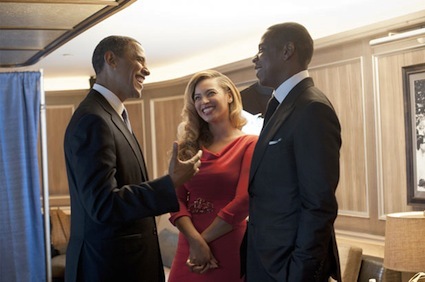 Now we also all know that Jay-Z and Obama have been supporting Obama’s reelection pretty loudly and that in doing so everyone expect them to support Obama until the end. We have all learn Peter Parker’s lesson ” With great power comes great responsibility” but J & B do not seem to be too much in a Peter Parker moods this days. So why am I even talking about this right ? Well because we are slowly it seems hitting the wall of everyone using rap to look cool, treating them like fools not really understand the power that rap artist have been gaining over the years. The problem is that an artist is not a politician, and when it comes to it, the best thing an artist can be is a symbol. There is no revolution, the relationship between artists and politicians has always been here and field like any relationship with tensions but today it is rap artist with more power. We are today in a world where everyone listens when Jay or Kanye talks, we are now in world where both of them can get the president itself in trouble because they are way more than just artists, they represent an economy, they are business man more than ever. So what is it going to be. When the players are new to the game, and different with their hand, what is it going to be ? Anyone wants to things with class or is going to be a chicken fight, with Jay playing it gangsta in front the White House. What is it going to be ?